March 2015: It’s bark time herbal wildcrafters! You can read about the seasonal rhythm of herbal medicine making here. In honor of bark time I thought I would share with you a few of my favorite print resources to aid you in your identifying the trees and shrubs around you. We herbal lovers often have our eyes trained on the ground. We walk along looking for the tiny white flowers of Chickweed blooming among the grass, or the tiny purple heads of Self-Heal. We walk through the tall pasture seeking the blossom heads of Red Clover or the inconspicuous Cinquefoil that grows to mid-shin height and we seek to distinguish the green of Nettle, Horsetail or Catnip from the sea of green in the distance. Many students of herbal medicine can identify dozens and dozens of local plants, yet many tell me they struggle with the trees. The trees and shrubs may be a bit more challenging yet very gratifying to learn. As you dive into the study of trees and herbal medicine you realize the remarkable number of trees that are either medicinal, edible or both. Trees also offer abundant food and medicine that one can harvest with very little impact on the tree itself. Black Walnuts, Elderberry, Hawthorns, the buds of Poplars….they seem to drip off the trees, there for whomever would collect them, both people or animal. These fruits seem freely given and don’t require you to take the life-sustaining roots or even the leaves. Even harvesting bark for medicine can be a very low impact activity. Just one slender young branch from a giant Oak or a Wild Cherry, a Viburnum or Sumac yields enough medicine for most herbalists for years. If anyone has spent hours picking through the grass for Chickweed, or trying to fill the smallest jar with Violet blossoms. Tree medicine is often a gratifying exercise in efficiency. What makes trees harder to learn? To begin with many plant folks find it hard to distinguish between the many species in a given genus. For instance, twenty species of Willow can be found in Minnesota, nine species of Oak. The Prunus genus (Cherries and Plums) boast seven native and naturalized species. Throw all the non-native varieties and cultivars planted on boulevards and in parks and gardens and you can get a mix that is understandably confusing. The long life cycles of trees can also make trees a bit more confusing to learn. The bark of young trees changes often dramatically as the tree grows into maturity. The silhouette of a tree, which can be helpful in identification is most apparent with mature trees as well. A lack of vocabulary about trees is also stumbling block for many students. Below are a few excellent print resources for learning to identify our local trees and shrubs. I have included primarily texts that cover Minnesota and Wisconsin. On the whole, I don’t bother with field guides for North America or even the Eastern United States. You are sifting through material that isn’t relevant to where you live. It’s just distracting. Even a tree field guide for the eastern United States is going to include trees from Florida, Georgia, South Carolina. This just serves to further challenge us and distract us. Stick to local field guides. Finally–this is important–you shouldn’t rely on one single book to learn a plant well enough to harvest from it. Plan on getting several of the books on this list and check the entries for the plant you think you are looking at in more than one reference. Plant id from books is easier after you have a considerable amount of plant identification experience and education about plants under your belt already. If you are ever in doubt, find a knowledgeable human to help you on your journey. Trees and Shrubs of Minnesota by Welby R. Smith. This is the tree bible for Minnesota but I would expect considerable overlap with other upper midwestern states like Wisconsin and Michigan as well. At 700 pages with a hardcover binding, it might not be a guide you want to throw in your backapack, but everyone serious about learning our local trees should plan to invest in this book–it’s worth every penny. 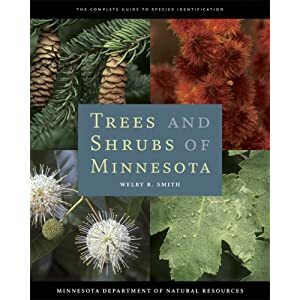 Trees and Shrubs of Minnesota is written by Welby Smith, a botanist with the Minnesota DNR and author of Orchids of Minnesota. 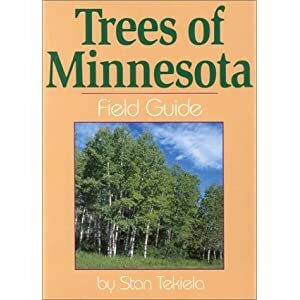 Trees and Shrubs of Minnesota begins with a good introduction to the biomes of Minnesota and the history of forested areas from European arrival to the present. There’s a key for serious botanists, but even if you know much botany, the photo and texts alone are excellent. It is organized alphabetically by genus, using the scientific name. This makes browsing as a method of narrowing down your possibilities for identification challenging for beginners. However, it’s a fine way of organizing the trees if you already think you know the genus or you can narrow it down to just a couple of genera. For instance, you know you are looking at an oak or poplar of some sort, then it’s easy to look at all of the species represented in that genus. Profiles of each species include quality photos of bark, flower, fruit/nut, leaves, often include line drawing of silhouette, and Minnesota and North America distribution maps. Distribution maps are a great assist for plant identification. If you live in Minneapolis and the shrub you are trying to identify a shrub that you are pretty sure is in the Rubus (Raspberry/Blackberry) genus and the map shows that this shrub is only found in the arrowhead region of Minnesota, then this probably isn’t the Rubus you found by Lake Nokomis. Of course, there are plants that can be found outside of their range, but this helps you understand the likelihood that a certain tree or shrub grows in your area. The beautiful rendered line drawings of tree silhouettes are also very helpful learning trees and shrubs. I also appreciate that each entry includes the date range of dates during which each tree flowers and fruits. You really should own both Stan Tekelia’s field guide and Smith’s tome mentioned above. Smith is for your bookshelf and the other for our backpack. Trees of Minnesota Field Guide is a tiny book that you can easily throw in your bag when you hike or wildcraft. At 195 pages, mostly consisting of plant profiles and photos, it packs a lot of information in a small package. The photos are high quality with a large picture of the leaves of each tree and two or three small photos of other elements of each tree profiled like bark or flower or fruit. There are also handy little icons in upper right hand corners indicating leaf arrangement type and in the upper left there is a line drawing of the silhouette of each tree next to a house to to indicate the size of the mature tree compared to a two-story house. Each profile ends with a paragraph called Stan’s Notes which sometimes includes natural history or ehtnobotanical details which are generally pretty interesting. I recognize that in my first few paragraphs of this post I urged students to avoid books that are not specific to their region. I live in Minnesota. 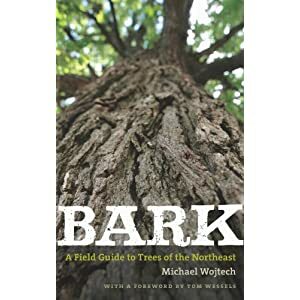 And Bark is a book the is for the Northeast. I broke my own rule. I broke my own rule because this book is so unique and valuable. As the title suggests, this book is all about bark. The chapters on bark ecology are fascinating. The author explains the role of bark in the lifecycle of the tree and how the bark may respond to climate stressors, infestations, infections, fire and other injuries. This is the chapter where you get to read about cankers and galls. You will learn something new, I assure you. There is a also a great chapter on bark types. Lenticels, strips, ridges, furrows, plates…. This well illustrated chapter will help you build the vocabulary you need to describe barks accurately and in detail. There’s a key based almost entirely on bark characteristics. I had a lot of fun with my students trying to key out trees using this book. We attempted to key out trees that I was confident about the genus and specuies. We didn’t always end up with the right genus and species. It was a fun and illustrative exercise. It is my opinion that bark alone does not always offer sufficient characteristics to accurately identify a tree. Keying out plants that you already know and seeing if you ultimately get to the right species is a fun way to play with botanical keys and recognize your weaknesses in observing and describing the plant (and also the quality of the key). If you can’t get to the right species of a plant you know well using a particular key, then you probably shouldn’t rely on your skills using the key to identify an unknown plant with the intention of harvesting it. These books are not specifically about trees. However, between the two volumes about two dozen shrubs and trees are included. In the world of learning about plants and learning them really well, learning them well enough to harvest medicine or food from them, two dozen is a lot. Two dozen is enough to make it onto my list of valuable tree and shrub print resources. 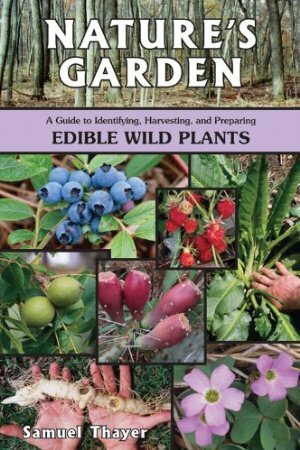 These books are organized primarily as a series of monographs of edible plants. The author, Samual Thayer, lives and works in Northern Wisconsin and nearly all the plants are found in Wisconsin and Minnesota. If you are an upper midwestern wildcrafter or forager these books will be a welcome addition to your library. The level of details in these books is really impressive. Each monograph is several pages of intimate detail. There are photos of distinguishing characteristics including bark, or stem, root, leaves, seeds, fruits. Some of the pictures include a human hand which is a great way to show the size of the item being photographed. 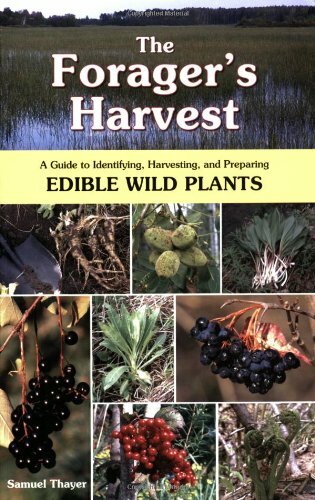 Unlike the previously mentioned books, these books are geared toward the reader who is interested in harvesting from these plants and include a lot of information relevant to harvest including when to harvest, how to determine ripeness and quality, methods of harvest and collection. Thayer also often discusses plants that are similar enough at first glance that some people get them mixed-up. This is really helpful. There’s really no excuse for mixing up elder with water hemlock–they are significantly different– but just in case, this book has side by side photos and descriptions. Almost anyone can learn plan id, but there’s no substitute for careful and patient observation and discernment of details. Thayer is an opinionated writer. He also liberally shares personal experiences with plants from childhood and in his life as a forager and wild foods educator. The strong opinions and memories make these books come alive. Happy reading folks! If you have other favorite tree and shrub resources, feel free to share them in the comments section. Thanks for the great info – I definitely under-utilize trees and shrubs. Are you going to be teaching your trees and shrubs class again this year?? I’m very interested! Unfortunately, no Trees and Shrubs series this year! Maybe next year.